I think that the concept and idea behind this is good. However, the execution is very poor.Speaking as someone in the themed entertainment industry, if the architects had gone further afield and spoken to people in my industry, they probably would have gotten a much better final piece. I am very curious to see this in person. Hey, I think people often underestimate just how tricky it is to pull off an artistic project of this scope on a tight budget. The possibility of things not going as planned is what makes art — especially public art — so exciting. And if you don't like it, don't worry. It will be gone eventually. I applaud the effort. ...so you're trying to spin this as "exciting"? This reminds me of a tinfoil art project done in elementary school. You remember the time you tried to make a real looking star out of card board and aluminum foil for the Christmas tree? That's what this looks like. There's so much GOOD art and GREAT artists in Flint. Why?!? 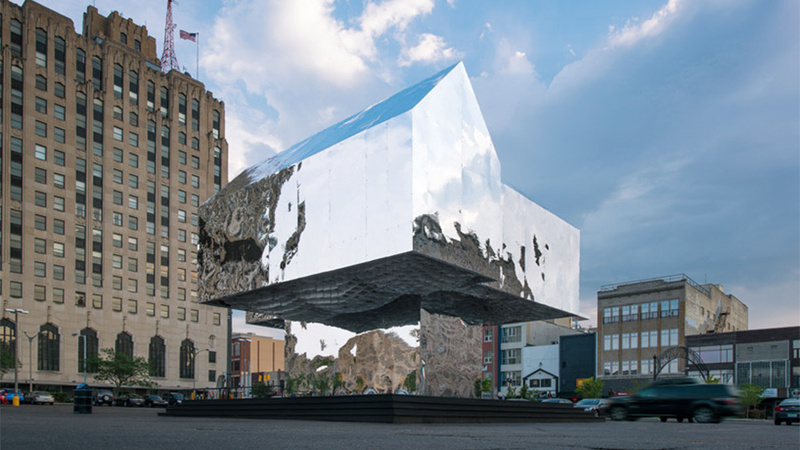 With all the artistic resources in Flint, I think it's a shame that they took a final [hideous] project from people who were not from or in Flint. Mott & UM-F's art programs are outstanding, full of young talent, and right around the corner from this piece. Why not ask locally instead of globally? Show Flint what Flint can do for itself. 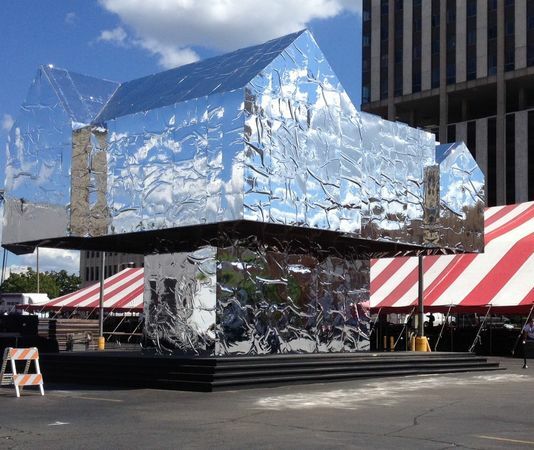 Besides, why would someone create a monument to a foreclosed house? If you had cancer, would you want a statue of a cancer cell placed in your front yard? I find that rather tasteless. Duders, this is Flint. How many times have we been promised something amazing, but received a turd instead? 'toids should know better than to get their hopes up about superfluous things like the floating house. I like the wrinkled aluminum foil reality better than the hoity-toity fantasy version. It suits us. If the the contest was to "create a metaphor for Autoworld" then this wins hands down. Should have known something was up when the guy's mockup included a 30 floor Genesee Towers and reputable lookin''toids sauntering about the mylar monument. This isn't about hard times, money not spent well, sending poor kids to college or anything else. It simply looks like hell. It would have looked like hell at any time in Flint's history--including at it's peak. It's just bad, period. This looks like my Longfellow elementary Valentine box (a shoe box covered with Reynold's wrap) save for the red construction paper heart. This looks like they bought the Meijer brand Aluminum Foil and it kept creasing. Regarding "money not spent well"...I'm under the impression that this was private funding. If a private art supporter wants to fund something, I reckon that's his/her business. Each of us non-funders may have an *artistic* opinion--in the instance at hand, mine is that the work is incomprehensible, even when accompanied by a text explanation--but how the funder chooses to spend his/her money is their own choice. My view is that we're much better off with more art, some of which is incomprehensible, than we would be with less art. Regarding the technical basis for the wrinkling: I have a lot of engineering experience with polyester films . It seems strange to me that the aluminized film would X-Y expand after application, under normal conditions. Maybe they heated the film, mistakenly expecting it to shrink-fit into tautness, and instead it relaxed? Sometimes art benefits from engineering support.